Shockingly, it didn’t work. Knock you over with a feather, I know, but the still unspecified role former Toronto Raptors general manager Bryan Colangelo was supposed to play alongside new Raps GM Masai Ujiri is now kaput. Colangelo resigned from whatever the heck post he officially had on Wednesday to take on another “whatever the heck”-post with Maple Leaf Sports and Entertainment group. He’ll work as a business consultant, with terms that are just as nebulous as the basketball terms he was supposed to contribute within when MLSE decided to keep him on last month. For many, the worry was that Colangelo would still hold sway over Ujiri, a reasonable fear for Raptors fans that haven’t seen their team in the playoffs since 2008, while paying big money for middling talents along the way. Ujiri used to work under Colangelo in the Raptor front office, so it was fair to wonder if the protégé would have a hard time breaking away from Colangelo’s charismatic sway. Ujiri has fired long-time scouts and dismissed fan favourites in Alvin Williams. He’s thrown his weight behind Dwane Casey as head coach and has been burrowed into his phone the past 48 hours trying to get the Raptors a draft pick they can use Thursday night. And he’s done it all with minimal input from Colangelo, according to sources. That’s got to be tough for Bryan, considering their past. It’s also fair to assume that the only reason Colangelo took his month-old job was the hope that Ujiri would fall back into the same sort of working relationship they shared while Colangelo was still calling the shots with Ujiri in a deputy role. We were already impressed by Ujiri before, and the obviousness of the situation (Colangelo had built a bad setup for the Raptors, he shouldn’t be listened to much anymore, et cetera) doesn’t make it any less startling that Ujiri wouldn’t give his former boss a bended ear. But exactly which direction the team might be headed in has been closely held. Was he blowing it up? Was he going to try and stay the course and see if a few tweaks could get the Colangelo-assembled core into the post-season for the first time in five years? Colangelo was probably right in his hope that a healthy season for all of his acquisitions would result in making perhaps the eighth seed of the 2014 playoffs, especially if corrective eye surgery (this isn’t a joke) for Rudy Gay improves his shot selection and shooting percentages. The Raptors are set to pay the luxury tax next season, though, if they bring everyone back. You don’t pay the luxury tax for eighth seeds, and even well-heeled organizations like MLSE shouldn’t have to pay $72 million for 41 wins. This is why Ujiri is likely attempting to blow things up. Remember, this is the man who built a hoped-for championship contender around Andre Iguodala, who despite sharing Gay and Demar DeRozen’s woes with long-range shots, suits up as sort of an anti-Rudy Gay. Stat-minded, younger NBA executives and observers don’t really fancy anyone on the Raptor roster save for young center Jonas Valunciunas and Kyle Lowry (and even Lowry is pushing it, by clashing with seemingly every coach he’s ever met), and it isn’t a stretch to assume that Ujiri shares that opinion. The problem is the landscape in NBA GM-dom is changing, and the new Raps GM isn’t likely to find as many takers for Rudy Gay’s two years and $37 million left on his deal as he would have five years ago. Eliminating ties with Colangelo is one thing, signing up for a rebuilding job is another. Actually finding two to tango, as you attempt to move players along? That’s a toughie. Ujiri won’t have a pick in this year’s draft, because Colangelo (in not all that bad a move) dealt it for Lowry. Valunciunas is a keeper, but young big man Ed Davis was sent away for Rudy Gay, and Andrea Bargnani and DeRozan are already on their second contracts – set to make a ridiculous combined $22.25 million next season. The Raptors can dive under the luxury tax by waiving either Bargnani or Linas Kleiza with the amnesty provision, but acquiring trade partners for the other players won’t be as easy as, say, acquiring a draft pick in Thursday’s draft. 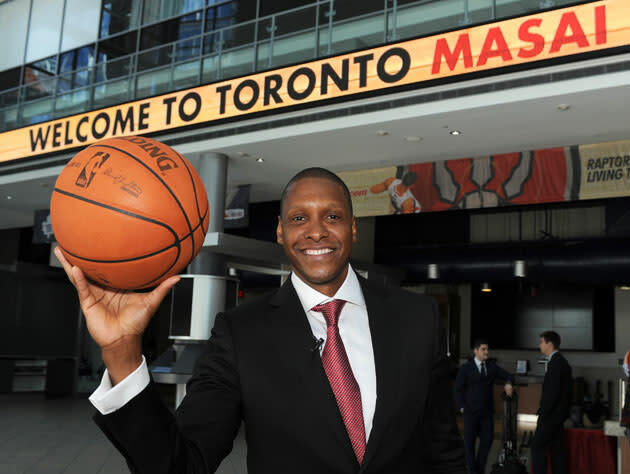 Tough gig, Masai Ujiri. You don’t need consulting, you need comforting.